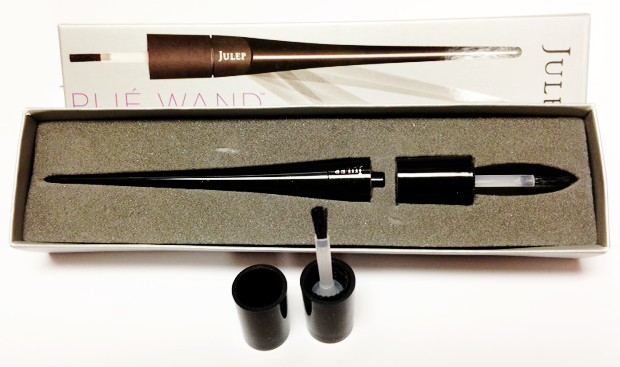 So this is the month of the Julep Plié Wand and boxes for people who participated in the crowdfunding got their boxes (less add on's) shipped out early this year and my box arrived today. I added on a polish this month, which is set to arrive next week and as such isn't included in this post. An ergonomic nail polishing tool designed to solve common polishing pain points and give you better results. Imagine if you’d spent your whole life writing with a pen cap and then someone finally handed you a full-size pen. That’s what it feels like to polish with the Plié Wand. 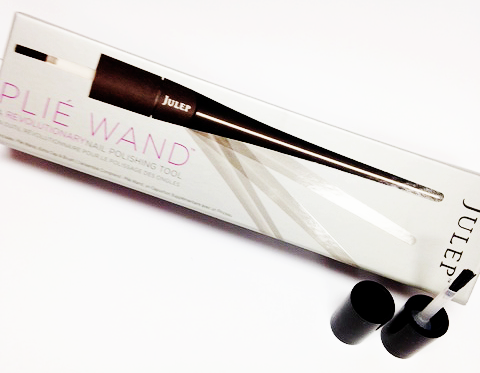 I was actually fairly excited at the idea of this wand, even though I think I'm pretty good at getting a good polish application on my nails (after a lot of practice). I'm always pretty excited about innovative beauty tools and this seems like it does have some potential to make nail polish application a little bit easier... With some practice, that is. Upon receiving my box, I couldn't resist adding a quick coat of polish to my accent nail to see if this is worth the hype. After using it once, what I will say is that it's going to take some getting used to and a few more applications before I can really say if this is going to be a help or a quirky, but ultimately disappointing add on. I didn't find that it made the application any easier for me the first time I tried it, but I think that perhaps once I fiddle with it a little and figure out the best way to use it that it does have the potential to be good. I'm not sure how I feel about the construction. One of the magnets on the extra Overcaps that were included fell off as soon as I tried to detatch it from the wand, which speaks to the use of insufficient adhesive. I managed to press it back on and it seems to be staying for the time being, but it looks like I'll have to wait and see. I do like that they changed the design so that you don't have to invest in new caps for the Julep polishes that you already own, particularly because it seems like something of a no brainer. I also tried it with a couple of other polish brands and it does seem to fit some of them, which is nice. All in all, I'm going to hold off judgement until I've done at least a few manicures using this tool. The one thing that I'm hopeful about is that it will be helpful in doing polish on my toenails, which is always an awkward and frustrating endeavour for me. Onto the polishes... Which, I will say now, holds on definitely disappointment for me. Jeanne - "Jet-set blue crème"
If swapping out were an option at this point in time, I'd have swapped out Jeanne. There isn't actually anything wrong with his polish, but I feel like it's a little boring in general and that I already have similar colours in my collection. That being said, the swatch leans a little darker than it looks in the bottle and the opacity seems good. I don't hate it, but it's just kinda meh. Paulette - "Golden lilac tulle shimmer"
This is the shade that convinced me to stick with my Boho Glam box, literally for the first time since my introductory box, this month. I was somewhat intrigued by the inclusive of the world "tulle" in the description, and I felt like this shade was definitely one of the more unique options this month. This is also the shade that I threw on over the manicure that I'm already wearing to try out the Plié wand and I have to say... YES. It definitely leans a little bit orchid for me, with more pink to the tone than blue, and the sheen of fine gold shimmer is just incredibly pretty. These past two months, I feel like Julep is really killing it with their purple shades and I am impressed. This will probably be my next manicure. Yumi - "Pink, silver and holographic glitter." When I received my Speckled For Spring Mystery Box 9 days ago, I wasn't particularly in love with this polish and had every intention of giving it away. Now that I received it again as a bonus polish this month, it seems that two of my friends or family members will be getting bottles of this as little gifts. It's fine, I'm sure lots of people would love to add it to their collections, but I seriously wish that they would do a little record keeping so that they didn't reward Mavens for supporting their crowdfunding (which I'm assuming is why I received a bonus polish at all) with polishes that they just received. Would have been nice, I think, for them to have left this out of the Mystery box if they were going to use it for this purpose just days later. I wish, instead, that my add on had come along with everything else, since Iona is the polish I'm most excited about this month, but I guess I have that to look forward to next week. Julep recently announced that they're going to be offering new customizable boxes for Mavens, and I'm still trying to decide how I feel about it. On the one hand, there have been times when I've been disappointed by the curated pairings and have wanted one polish from one box and one from another, and I'm sure I'm not the only one, so that freedom is nice. The thing that I don't like about it is that you are required to commit to a 25% increase in the price or pay for 3 boxes ahead of time to get the same price we're paying now. $19.99 is basically the most I'm willing to pay for what I receive each month, and even that I've been considering as to whether or not it's overpriced, so a 25% price increase seems pretty steep to me. I've been going back and forth on whether or not I want to stick with Julep and my indecision might ultimately mean I'm skipping for the next few months until I decide what I want to do. Anyone else feeling the same?